But I have two very good reasons for posting this particular pizza. The first has to do with the sauce. Long time readers will know that I am not in the habit of putting tomato sauce on my pizzas. I wrote a post on this very topic a few years back. It isn't that I don't like tomato sauce...it's just that it can be somewhat limiting. There are so many other interesting options—almost all of which have appeared on my blog: a simple smear of plain or infused olive oil....ricotta cheese...vegetable purées...and most recently, a mixture of crème fraiche and fresh cheese. Recently I discovered (via two different pizzas at two different restaurants) another delicious option—reduced cream. Reduced cream (heavy cream simmered until it is thickened and reduced in volume by 1/3 to 1/2) makes an amazing sauce. It is silky...and surprisingly ethereal. 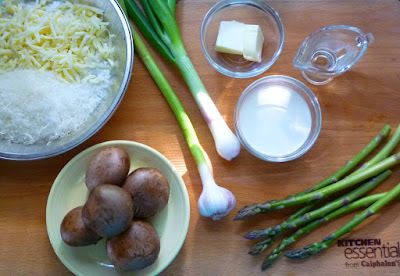 It may be used plain (just put a quarter to a third cup of heavy cream in a small saucepan and simmer until it is thickened and reduced) or combined with a bit of pureed roasted garlic...or, as in my recipe today, mixed with a whole head/stalk of softened green garlic. When I build a pizza, I typically spread 2 to 2 1/2 ounces of cheese on top of the crust before adding other toppings and then more cheese. When you sauce your pizza with reduced cream you can dispense with that bottom layer of cheese. 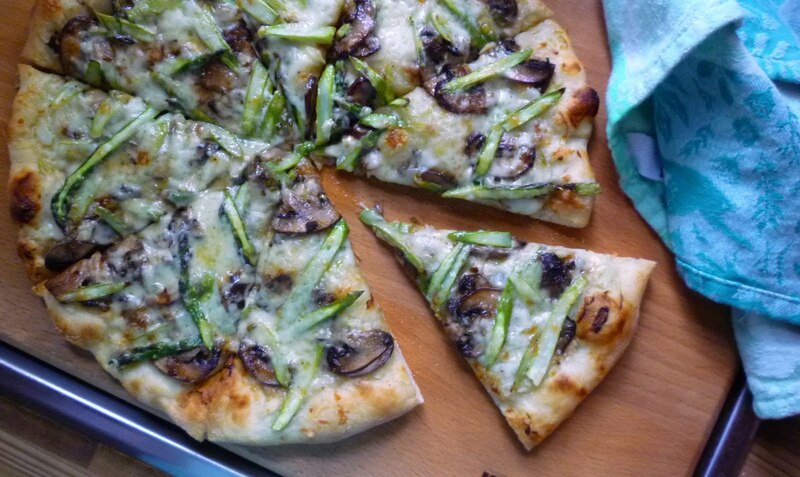 The green garlic version of the reduced cream is the second reason that I wanted to share this particular pizza. 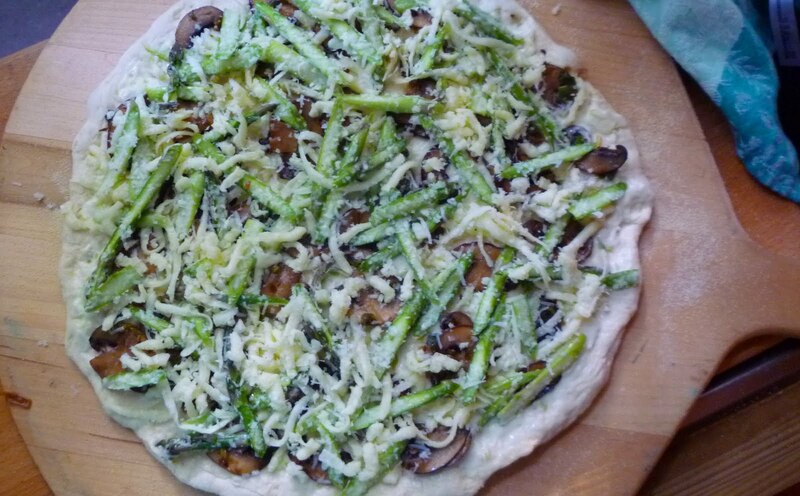 Not only is it fantastic with the asparagus that is pouring into the market at the moment (if you've never had asparagus on a pizza before, you are in for a treat...I posted another one a few years ago), it would also be wonderful topped with the greens that have just begun to fill the stalls (kale, spinach, chard...). Furthermore, the reduced cream sauce makes an excellent vehicle for the green garlic itself and posting the recipe gives me a chance to talk a little bit about green garlic. I have been bringing green garlic home with me from the farmers' market every week for the past three weeks. I have used green garlic before (even featured it in a post), but I have never paid very special attention to it at the farmers' market...possibly because it wasn't that abundant at my old market. But at the market I have been shopping at since last June (The Brookside Farmers' Market in Kansas City), it is abundant...and it is truly a special treat. Green (or new) garlic is to garlic what spring onions are to the onion family: the early, young version of what eventually becomes the storage garlic (and onions) that we see in the grocery store. 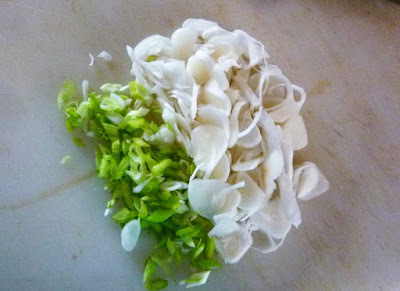 For years now spring onions have completely replaced regular onions in my kitchen during late spring and early summer. I am guessing that I will in the future be using new/green garlic in the same way. Like spring onions, after trimming away the root, you may use not only the white (or rose) portion...but also the green. The very first green garlic to come into the market will not even have begun to form cloves or a head...it looks very much like a slender leek. You can tell it is garlic by taking a sniff....the stalk will smell like garlic. Later, the heads will begin to swell with the forming cloves. You may still use the whole thing, but as the season progresses, the sheath that protects the cloves will begin to toughen a bit and you might want to slip it off and discard it (depending on what you will be using the garlic for). The darker portion of the green also becomes tougher as the season progresses...and again, depending on use, you might want to use only the white and pale green portions. 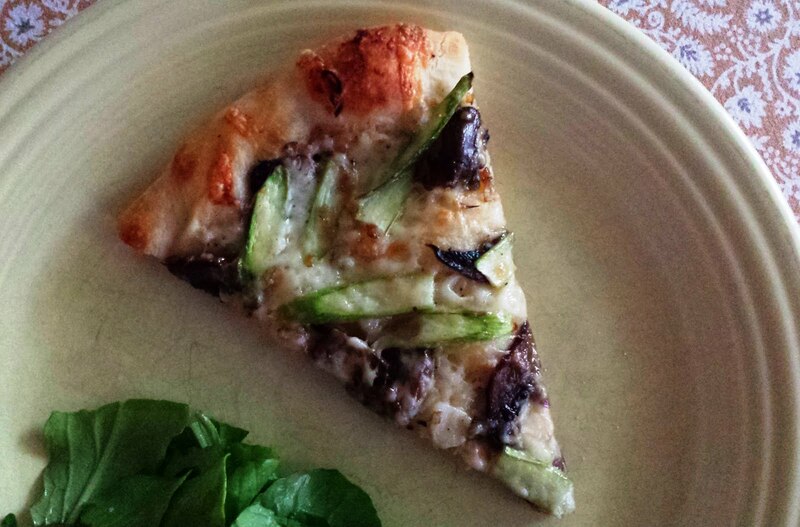 In general, you can use green garlic everywhere you would use regular garlic...you can just use more. You will get the wonderful taste and aroma of garlic, without the heat and strength of storage garlic. Suzanne Goin makes the observation in her book Sunday Suppers at Lucques that when green garlic season comes to an end she feels bereft. I imagine I will feel the same. Before I end my post today I wanted to make an exciting announcement. I have been asked by the growers of the Brookside Farmers' Market to be their official Market Chef! For the moment this means that I will be developing recipes for them with the beautiful ingredients I find at the Brookside Market. The recipes will appear on my blog in the normal fashion (as part of a normal post). 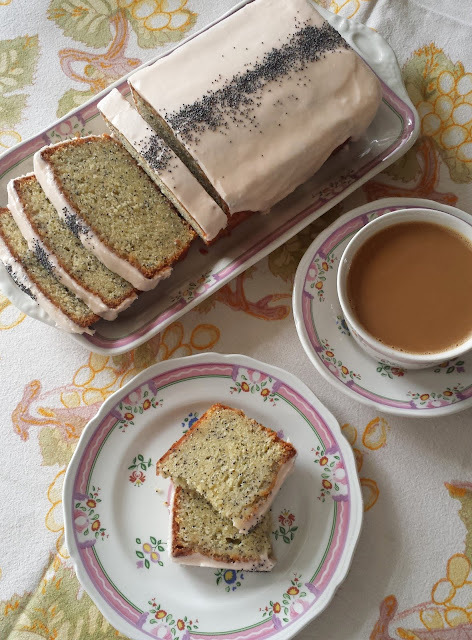 Additionally, I have set up a separate Brookside Market page (tab at top) where all of these recipes will be cataloged...and if the specific grower of the featured ingredients hasn't been mentioned in the post, they will be acknowledged on the market page. Every now and then an opportunity comes your way that just feels like a perfect fit...and for me, this is one of those. As anyone who reads my blog already knows, the farmers' market is one of my favorite haunts. I look forward to the opening in the spring...and am at a loss when it closes in the late fall. People often ask me what is my favorite thing to cook...and I never know quite what to say...I love to cook (and bake!) a lot of things. But it occurs to me that what I truly love best is cooking from the ever changing palette of the seasons. I hope that this new partnership with the Brookside Market will encourage even more people to get out, explore their local market...and bring home something fresh and beautiful to cook for their family and friends. Preheat the oven and pizza stone to 500°F an hour before you plan to bake the pizza. 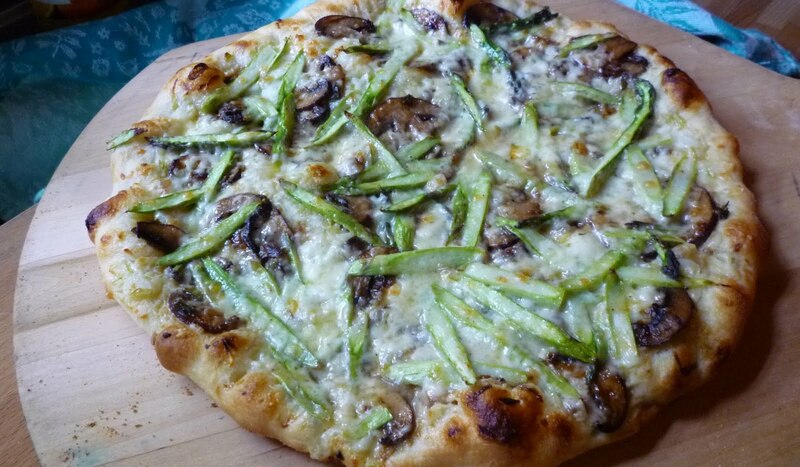 If you made the dough ahead, pull it out of the refrigerator when you turn on the oven. Place a tablespoon of butter along with a tablespoon of water in a small sauce pan and set over moderately low heat. When the butter has melted, add the green garlic along with a good pinch of salt. Gently stew the garlic until it is softened and the water has evaporated/been absorbed and the garlic has softened (about 5 minutes). Add the white wine and continue to simmer until the wine is reduced and the garlic is sizzling gently in the butter again. Add the cream and simmer until thickened and reduced by one third to one half. Taste and season with salt and pepper; set aside. Heat a tablespoon of oil in a medium sauté pan set over medium high heat. Add the mushrooms and sauté until tender and caramelized. If you like, add a splash of water, or white wine, to deglaze the pan...continue to cook until the water/wine has evaporated. Transfer to a plate and season the mushrooms with salt and pepper. Let the pan cool briefly before returning to moderate heat. Add a tablespoon of butter. When the butter is melted, add the spring onions along with a pinch of salt and cook until soft and tender (five minutes or so). Return the mushrooms to the pan, toss to combine and continue to cook for a minute or two to blend the flavors. Taste and correct the seasoning. Set aside. In a medium-sized bowl, drizzle the olive oil over the asparagus and season with salt & pepper. Toss to coat. Add the cheeses and toss to combine. 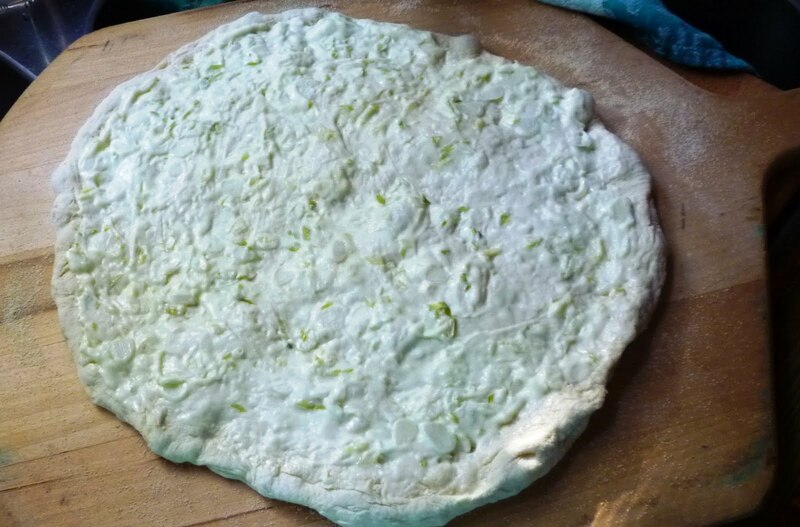 To build the pizza: On a lightly floured surface, roll or stretch the dough out into a 12- to 13-inch circle. Transfer the dough to a pizza pan, baking sheet or peel that has been lightly dusted with semolina, fine cornmeal, or rice flour. Spread the garlic cream over the crust, leaving a half inch border around the edges bare. 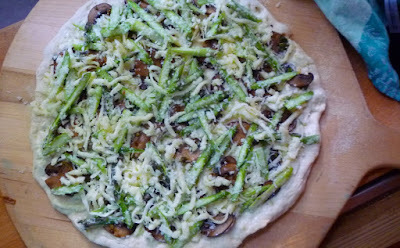 Scatter the mushroom/spring onion mixture over the cream, followed by the asparagus/cheese mixture. If using a pizza pan or baking sheet, place the pizza in its pan on the pizza stone in the pre-heated oven. Bake until the crust is golden brown on the bottom and the cheese is bubbling, about 8 to 10 minutes. To insure a crisp crust, after the crust has set (5 to 6 minutes), slide the pizza off of the pan to finish cooking directly on the pizza stone. If you are using a pizza peel, slide the pizza directly onto the hot stone and bake until browned and bubbling (about 8 minutes). When the pizza is done, transfer to a cutting board and cut into wedges and serve. If not serving immediately (if making a second pizza, for example), transfer to a wire rack so that the crust won't get soggy. If you don't have an open bottle of wine on hand, simply start with 2 T. of water and cook the garlic until soft and sizzling in the butter. It is very important to cut the asparagus on a long bias, thus exposing as much of the interior of the spear as possible. 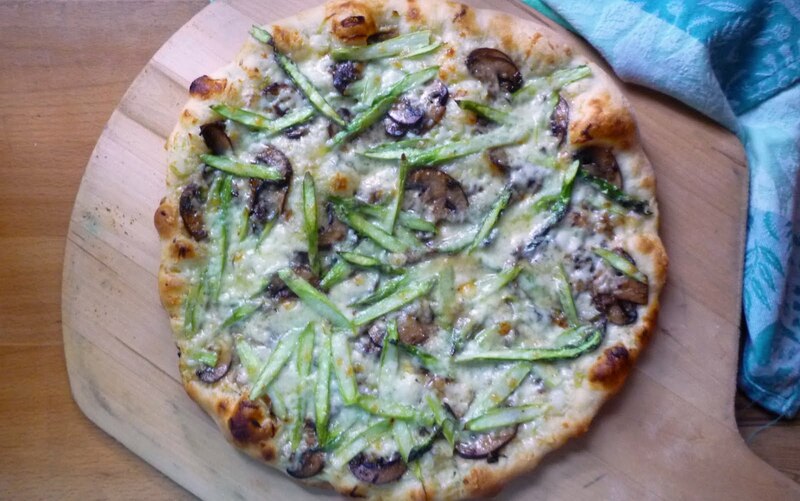 Asparagus that is cut straight across (even if it is very skinny) will not cook properly in the amount of time the pizza will be in the oven. Furthermore, the asparagus will not be able to release its fragrance (which will essentially be sealed in by the skin) into the other ingredients and the pizza will not taste like asparagus. Combine the water, yeast, and 3/4 cup of the flour in a large bowl. Whisk until smooth. Add the oil, salt and another half cup of the flour. Stir with a wooden spoon to form a soft dough that holds its shape. Sprinkle some of the remaining quarter cup of flour on a smooth surface. Scrape the dough out of the bowl and sprinkle with a bit more flour. Knead the dough, adding just enough flour to keep the dough from sticking, until the dough is smooth and springs back when pressed lightly with a finger—about 5 to 10 minutes. Transfer the dough to a lightly oiled bowl and cover the bowl with plastic wrap. Let the dough rise until it has doubled in size—about 1 hour. Punch down the dough. At this point you may use the dough immediately or cover the bowl again with plastic wrap and refrigerate it for 12 to 24 hours. Pull the dough out of the refrigerator to let it warm up a bit, about an hour before baking the pizza. When ready to make the pizza, turn the dough out onto a lightly floured surface. Roll the dough into a ball. Cover with a towel and let rest for 10 to 20 minutes. The dough is now ready to be shaped, topped and baked. Food Processor Method: Place the water and yeast in a small bowl and let sit until the yeast has dissolved. Place 1 1/4 cups plus 2 T. of the flour and salt in the food processor fitted with the metal blade and pulse to blend. Add the oil and yeast/water mixture and pulse until the dough is homogenous. Begin to run the mixture in long pulses until the dough is smooth and elastic—it shouldn't take more than a minute. If the dough seems wet and sticky, add some of the remaining 2 T. of flour a bit at a time, pulsing after each addition. Turn the dough out onto a lightly floured counter and give it a few kneads by hand.